Shuttleworth’s Slip-Torque; conveying surface handles your delicate products better than ever before. If you have marking, scratching, or breakage, Slip-Torque; is the answer to your concerns. Shuttleworth’s accumulation conveyors buffer products with minimal line pressure, which greatly reduces product damage. With over 65 roller materials to choose from, we are the experts in matching the roller material to the product and the application to provide the best surface solution for you. 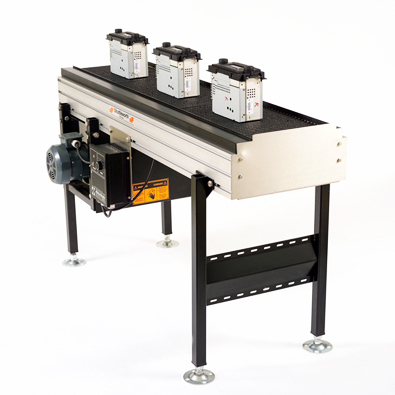 Low Pressure Accumulation Because of our unique design, Shuttleworth Slip-Torque® conveyors give you the added benefit of low pressure accumulation on every system as a standard feature. The Slip-Torque® rollers stop turning under accumulated product, minimizing the opportunity for product damage or package scuffing. Easily adjustable buffer zones provide efficiency during product change over and saving time saves you money.